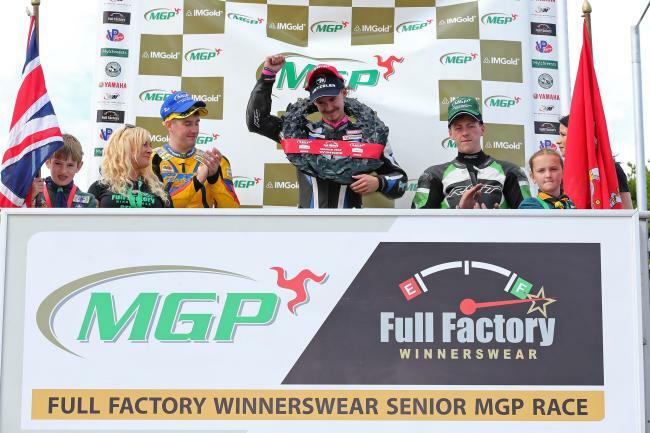 Nineteen-year old Malachi Mitchell-Thomas won his first Isle of Man Mountain Course race with victory in today’s Full Factory Winners Wear Senior Race at the IMGold Manx Grand Prix, breaking Alan Jackson’s outright lap record and Seamus Greene’s race record which have both stood since 2005 in the process. Excitement had been building all week at the battle between Silicone Engineering Racing’s Mitchell Thomas and the Isle of Man’s Billy Redmayne, riding the Martin Bullock Motorsport Honda and the pair didn’t disappoint. First honours had already gone to Redmayne in Wednesday’s Junior Grand Prix, although Mitchell-Thomas clocked the fastest lap, and the pair again went head to head in one of the most thrilling, and fastest, Manx Grand Prix races in recent years. However, with only two seconds separating the pair as they set off for their last lap, news came through that Redmayne had been hit with a thirty second penalty as a result of an infringement at the Creg-ny-Baa leaving Malachi Mitchell Thomas with a huge lead over second placed Rob Hodson. Hodson, fresh from his first win in the SuperTwin race earlier in the day, was first away from Glencrutchery road at the scheduled start time of 1pm but the story was really about Mitchell Thomas and Redmayne, and Mitchell Thomas laid down an early marker with the lead at Glen Helen on the opening lap, albeit by less than two seconds from Redmayne with Joseph Newbold in third and Rob’s brother Jamie in fourth with Andrew Farrell completing the top five. Mitchell-Thomas lost time between Ramsey Hairpin and the Bungalow with Redmayne edging into the lead but by only half a second with Newbold holding third and Rob Hodson moving up the field into fourth and Andrew Farrell completing the top five. Redmayne’s opening lap of 121.021/ 18.42.354, his first 120mph lap, gave him a lead of just over a second from Mitchell Thomas (120.889/ 18:43.575) with Rob Hodson (118.859/ 19:02.769) in the final podium place. On the second lap, Redmayne lost five seconds between the Grandstand and Glen Helen which moved Mitchell Thomas back into the lead and with the pair coming into the pits at the end of the second lap, Mitchell Thomas’s 121.937/ 18:33.917) gave him a lead of almost four seconds from his Manx rival with Hodson 119.709/ 18:54.649 holding third. Andy Farrell came off at the Creg Ny Baa on his second lap and was taken by airmed to Nobles hospital with a shoulder injury. Mitchell-Thomas gained almost another second on Redmayne in the pits and by Ballaugh on the third lap had extended his lead to nine seconds. However, Redmayne appeared to have cut the deficit on the leader to only two seconds at the Grandstand but as the pair headed out for the last lap and with all eyes on the timing screens at Glen Helen, it was announced that Redmayne had picked up a thirty second penalty for an infringement at the Creg Ny Baa on his third lap. The penalty removed any chance that Redmayne had of overhauling Mitchell Thomas and although he clawed his way back up into second by Ballaugh Bridge he was then reported to have retired at Ramsey leaving Mitchell-Thomas to claim victory in 120.138/ 1:15.22.415 over a minute-and-a-half ahead of Rob Hodson (117.601/ 1:16.59.944), who claimed his second podium of the day following his earlier win in the SuperTwin Race. With Redmayne’s retirement, Andrew Dudgeon (117.035/ 1:17.22.291) moved through to take the final podium place. With a number of riders still circulating, the race was red-flagged following three separate but simultaneous incidents on the course at Brandywell, Mayhill and the 33rd. David Taylor (Brandywell) and Martial Mourra (Mayhill) were both taken by airmed to Nobles for treatment, as was Donald Gilbert (Creg Ny Baa), who was reported to have leg and hand injuries. Nicholas Pauet and Simon Matthews both came off at the Creg-ny-baa but were reported to be OK as was Robert Nelson following an incident at the Waterworks.